Most recently, in early 2018, the opposition-stronghold of Eastern Ghouta came under heavy bombardment – including artillery shelling, mortar fire, airstrikes – by Russian and Syrian regime forces, the latter having reportedly also used chemical weapons. 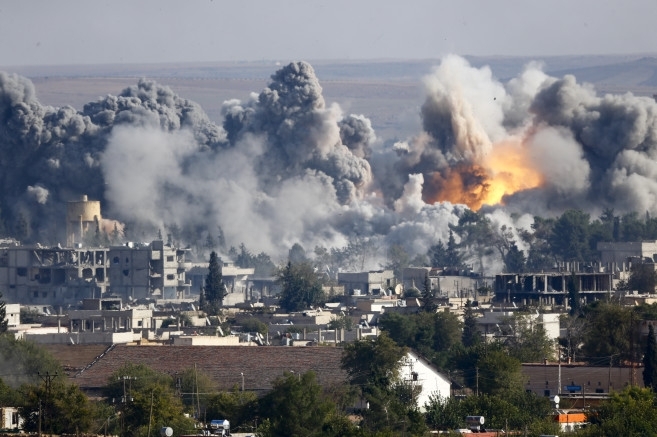 Several INEW members have reported on the devastation: Human Rights Watch reported that by early February, hundreds had killed and at least 13 hospitals struck in a bombardment civilians described as incessant and widespread, with bombs falling “like rain”; PAX reported a dramatic escalation in violence — with air strikes alone topping 70 per day in parts of January and February, as well as use of surface-to-surface missiles, artillery shells and cluster munitions – driving a humanitarian crisis and causing significant destruction of infrastructure. UNOCHA has reported over 50,000 displaced from the besieged area, as well as thousands killed and thousands more injured. As the humanitarian catastrophe continues to unfold, the UN has documented extensive destruction of infrastructure, with 93% of buildings damaged or destroyed in one district. But regime forces are not the only ones conducting operations in populated areas, with severe humanitarian consequences for civilians. In 2017, US-led coalition operations in the cities of Mosul, Iraq, and Raqqa, Syria, resulted in a sharp rise in civilian casualties as coalition airstrikes exacted a heavy toll. At the end of a 9-month push to retake Mosul, a report by Associated Press incorporating data from the UN, Amnesty International, Iraq Bodycount, and Airwars, put the civilian death toll at between 9,000 and 11,000. Drawing attention to the risks posed by conducting military operations in populated areas, the UN High Commissioner for Human Rights warned of the potentially “lethal and disproportionate” impact on civilians of strikes by coalition forces in Mosul. US-led coalition operations in Raqqa, where an estimated 18,000 to 25,000 civilians were trapped, was similarly devastating. An August 2017 report by Amnesty International documented the impact of the battle on the civilian population, particularly the Coalition’s use of mortars, artillery, and airstrikes. The UN estimated that 80 percent of the city had been left uninhabitable due to the destruction wrought by intense military operations including regular airstrikes and shelling. The UN’s Humanitarian Coordinator for Syria expressed deep concern over the high civilian casualty rates and the use of explosives in populated neighbourhoods. Common to all these assaults – whether undertaken by the Syrian regime or the US-led coalition forces – is a pattern of extensive humanitarian harm that includes high civilian casualty counts and deep destruction, with long-term consequences, to infrastructure. This is a direct and identifiable result of the decisions by those armed forces use of explosive weapons with wide-area effects in populated areas. Reducing this humanitarian impact remains a key priority for INEW, as well as for the United Nations, the International Committee of the Red Cross (ICRC), broader civil society and an increasing number of states.